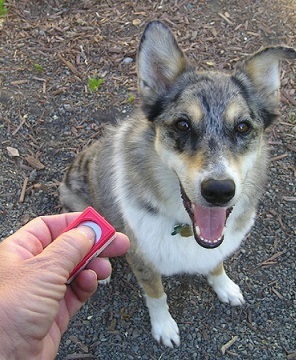 When clicker training was first introduced in the 1960’s, a dog training clicker (a mechanical noisemaker) was an essential tool for clicker training, and that’s how it stayed for decades. However, in today’s hitech world, you don’t necessarily need to buy a dog training clicker, instead you can download a dog training clicker app, which will save you the time of going to the shop, and, as most of these apps are free, a few dollars as well. In this article, I’ve listed the best dog training clicker apps for both Android and iOS smartphones. It’s a free really easy to use dog training clicker app that looks pretty much like the original mechanical clicker. The only difference is that instead of pressing the clicker you press the touchscreen on you Android powered smartphone. It’s said on the app’s description on Google Play that it’s brought to you by a certified professional dog trainer, and that, if you need to, you can adopt the app to work with other animals as well. You can get Dog Training Clicker Time Free for free from Google Play. 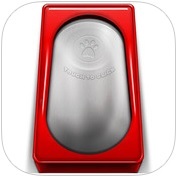 A free easy to use dog training clicker app for iPhone and iPod. It’s pretty much the same as the Android app I described above. However, Good Dog Training Clicker comes with a some kind of a dog training guide. I’m not sure how useful that is, but the clicker itself works great. A simple click on your touchscreen device emits the sound of a good old mechanical clicker. You can get Good Dog Training Clicker free from iTunes. Only one button with one sound? We can do better. Thinking custom sounds with multiple buttons.